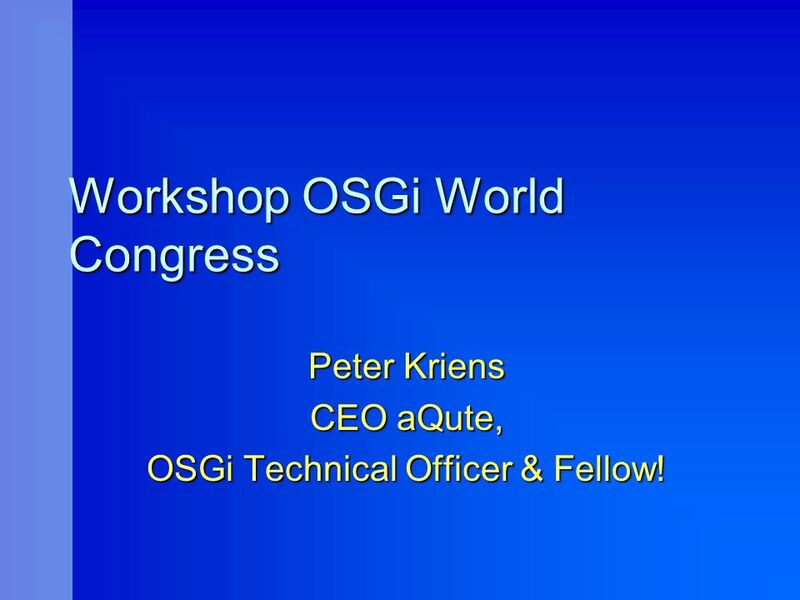 Workshop OSGi World Congress Peter Kriens CEO aQute, OSGi Technical Officer & Fellow! 1 Workshop OSGi World Congress Peter Kriens CEO aQute, OSGi Technical Officer & Fellow! 3 www.aQute.se - 2002 OSGi World Congress - 3 Welcome Purpose of this workshop Purpose of this workshop –Introduce how to make bundles (and why) –Agree? My Expectations My Expectations –Lively, reactive audience. Tell me if I stray too far! –Have a very enjoyable day Your Expectations? Your Expectations? Download ppt "Workshop OSGi World Congress Peter Kriens CEO aQute, OSGi Technical Officer & Fellow!" Intel® Teach Elements Implementation November 2009 Self-Study Facilitated Geo Options U.S. Process Example Use of Teachers Engage Online Community. 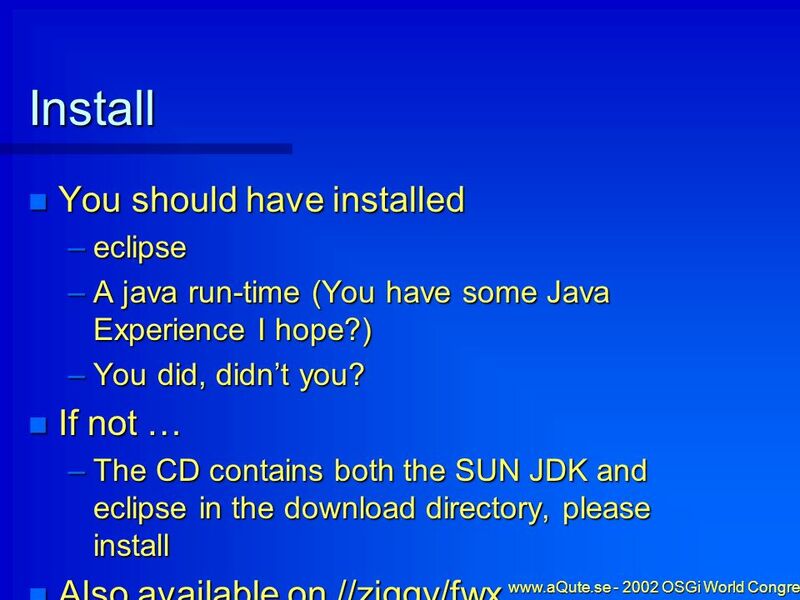 Copyright © 2002, Peter Kriens, All Rights Reserved OSGi versus UPnP??? There is no "versus" here. OSGi is fully complimentary to UPnP. No overlap. UPnP. OSGi World Congress Workshop Exercise By Peter Kriens CEO aQute OSGi Technology Officer. AQute OSGi Bootcamp Workshop Exercise By Peter Kriens CEO aQute OSGi Technology Officer and OSGi Fellow. © OSGi, All Rights Reserved - Brussel Jan 22 Ertico/OSGi Tech Spec Overview: Introduction OSGi R3 and Remote Management Ertico/OSGi meeting Jan.
AQute R4 By Peter Kriens CEO aQute OSGi Technology Officer and OSGi Fellow. 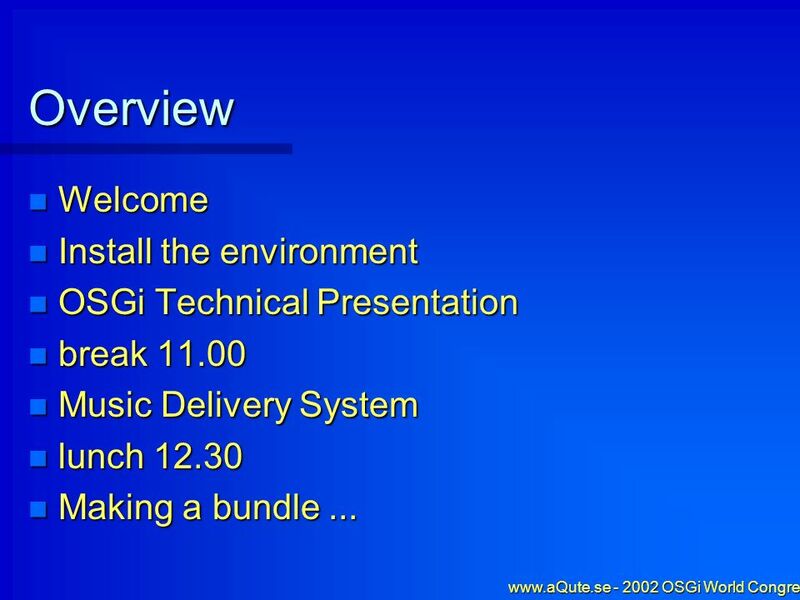 aQute Bundle Programming By Peter Kriens CEO aQute OSGi Director of Technology & OSGi Fellow. 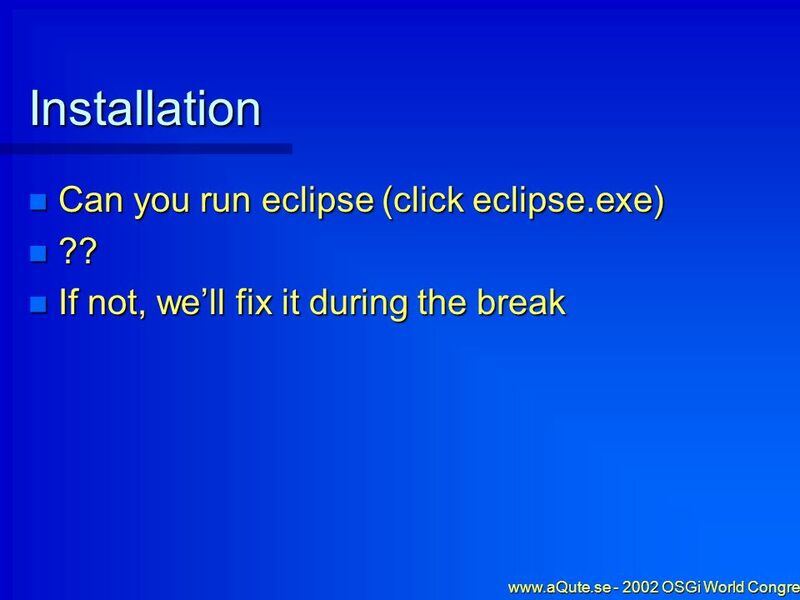 AQute Eclipse Environment By Peter Kriens CEO aQute OSGi Director of Technology and OSGi Fellow. SVQs Business and Administration Launch Events January/February 2011. OpusCollege and Spring-DM. OSGi based web applications – three strategies OSGi container embedded in another container: OSGi Bridge Server (OBS)  e.g. OSGi Technology Hsin-Han Yang, Cheng-Yi Chien, Po-Cheng Huang.